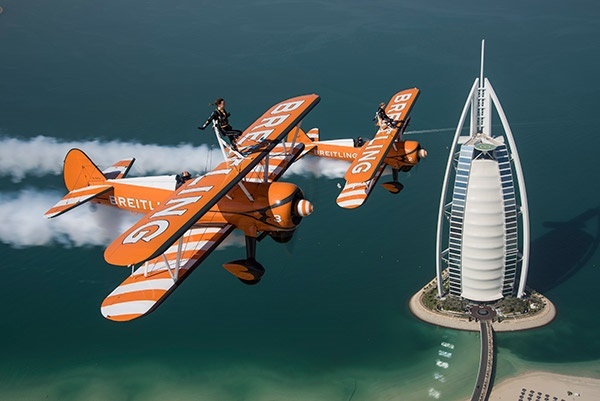 Breitling Wingwalkers Marie Killerby and Sarah Tanner left more than one heart aflutter yesterday when they headed skywards to perform their synchronised wing-walking routine. Their high-flying show, reminiscent of those put on by 1920s barnstormers, was charming and breathtaking at the same time. Strapped onto the top of a pair of biplanes, the two acrobats performed synchronised stunts including standing on one leg, and on their heads, before unclipping from their five-point harnesses and walking around the wing, tethered by only a small cable. Killerby works year-round as a wing walker, taking part in around 60 shows a year. But daredevil Tanner, who has been walking on wings for nine years, leads a surprising double life. For half the year she is the unassuming girl-in-accounts sitting in front of a computer in the show team's office. "It's hard work, I'm absolutely knackered," said the petite athlete at the end of their 20-minute show.